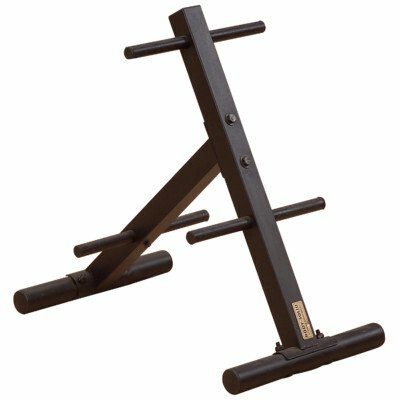 SWT-14 Features: -Keep your workout area safe and well organized with these smart weight trees. -Rock-solid EZ-Load design directs the weight load to the center reducing the risk of tipping. -Six storage posts suspend your weight plates for fast and easy storage and retrieval. Product Type: -Plate rack. Shape: -A-Frame. Weight Capacity: -1000 Pounds. Finish: -Gray. Powder Coated Finish: -Yes. Dimensions: Overall Height - Top to Bottom: -27". Overall Width - Side to Side: -24". Overall Depth - Front to Back: -16". Overall Product Weight: -20 lbs.